Featured Photo - These Wood Pellets Will Warm You Up! A priority for me as I look into the first year of my tenure as the Executive Director of the Pellet Fuels Institute is to get out there and visit as many member facilities as is practical to see and hear. It might be more appropriate to call this a listening tour as I intend to ask lots of questions and add the answers to a growing body of thoughts, concerns, and ideas from the PFI membership. Yesterday, I began this effort at the Indeck Ladysmith Biofuel Center in Ladysmith, Wisconsin-a facility I had some familiarity with after writing an article about it for Pellet Mill Magazine in 2013. A winter storm dropped a foot of snow all along my travel path on Monday, so my drive to Ladysmith was a pleasant meander through a winter wonderland. When I arrived, the parking lot was full of cars, a trailer was being loaded with finished product, and a truck was driving onto a truck dump ready to deliver some wood fiber: all good signs. Darren Winchester, who was my host on my first visit emerged from a production meeting and welcomed me into the facility's conference room. Churning out pellets in Ladysmith, Wisconsin. Within five minutes of our conversation, it was clear that Darren and his team at Indeck were trying to capitalize on the marketplace momentum they've worked hard to build since they began operations, coupled with a favorable heating season. 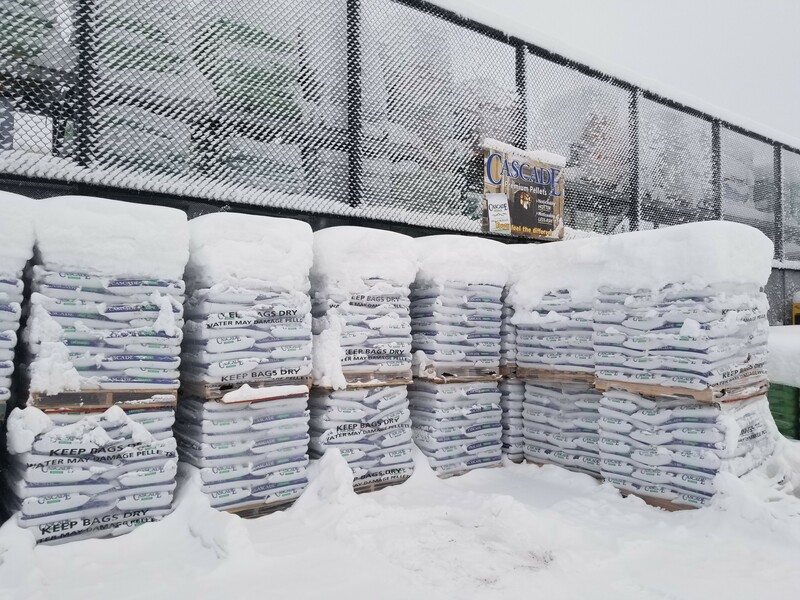 While the new snow made the area around the Indeck facility look like good pellet selling weather, it was the deep freeze that hung over much of the Upper Midwest in December that really got the inventory moving. As with every conversation I have with our producer members, I'll keep the details about Indeck's business between me and Darren, but I will share that right now, Darren and Indeck are feeling a bit of a staffing pinch. The Indeck team has plenty of overtime available as they work to keep up with strong demand, and even the die-hards and most motivated members of their team are beginning to wonder when they might return to a more normal work week. The challenge Darren shared with me is that the surging economy is moving a lot of the local talent off the bench and into the labor force, so finding quality folks has been more difficult. I asked Darren about the PFI, what it's done for him and the Indeck facility, and what it could do better. This was the question I had driven to Ladysmith to ask, and we had a great discussion. Many of the things Darren shared with me echoed what I've been told by the members I've already spoken to on the phone, and some of them were brand new. One item that I did share with Darren was the overwhelming support I've already received from everyone I've spoken to about the PFI playing some offense and actively working to grow the wood pellet segment. He enthusiastically offered his support for such an endeavor and I'm happy to report that the beginnings of a strategic plan are under development to guide our efforts to that end in 2018 and beyond. Please continue to watch the Pellet Wire for more details. After a bratwurst lunch grilled on a pellet grill, I visited one of Darren's customers in Ladysmith: Mark Buchholz, who owns and operates Buchholz Feed Store. Buchholz Feed Store, from a volume perspective, is a tiny actor in the entire pellet supply chain. Mark shared with me that he sells around 300 tons per year and in a cold year might sell close to 400 tons. He produced a spiral notebook from the counter where he kept track of customers who had purchased an entire ton from him, but stopped by to pick up 4-5 bags when it was convenient, so they wouldn't have to store an entire ton. Looking beyond the tonnage Mark moves, I was struck by the value that Mark was choosing to add to wood pellets. Mark is not the only retailer that is wrapping our product with great service. Still, I think the PFI needs to find instances like this whether they are in tiny, single location farm and seed enterprises like Mark's, or larger regional and national chains. How can the PFI assist retailers like Mark in carrying the value proposition of wood pellets to consumers? To me, this is a big question as we move into 2018 and one that ties directly into the larger initiative I hinted at. 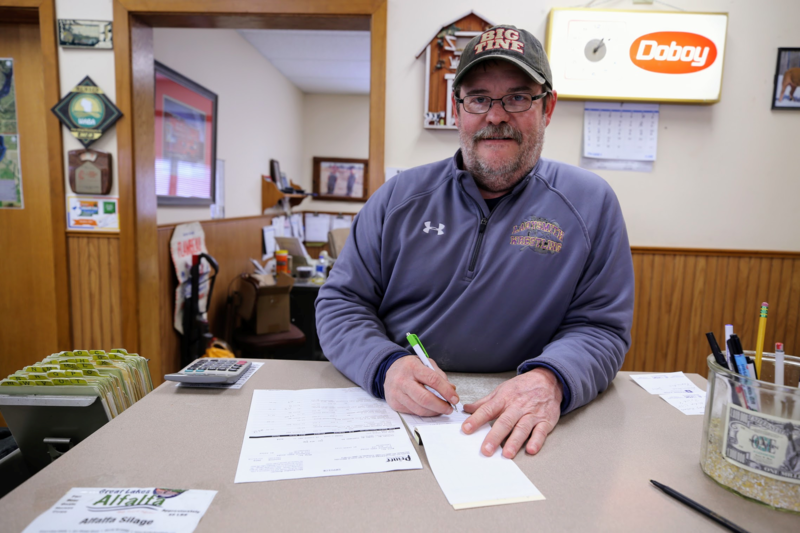 Mark Buchholz fills orders for pellets at Buchholz Feed Store. This morning, I'll visit the Lignetics facility in Peshtigo, Wisconsin and ask the team there many of these same questions. Watch for my recap of that visit in next week's Pellet Wire. In the coming year, the Pellet Fuels Institute (PFI) will embark upon a strategic initiative to take the message of the values and benefits of using wood pellets for home-heating to consumers. To appreciably grow the market opportunity for its members, the PFI recognizes that it must do more to promote pellet heating. This year's Breakfast & Biomass panel will offer attendees an opportunity to hear the early thinking on the approaches and strategic partners the PFI must successfully deploy and engage to be successful. The panel will explore the PFI's plans to use social media, a revamped brand and online presence and increased engagement with our hearth and home customers, and the potential for all of those channels to make consumers more aware of wood pellet heat. Additionally, progress toward a check-off program for wood pellet producers will be discussed. Go through the "Already Registered for a Badge" link: (orange box on the right). You will need to have the email and password you used when badge name(s) were registered. Then go to Registration Tools/List of Attendees/Edit Education. You can also call Rachel Pratt at HPBA at 703 522-0086 ext. 114 or email [email protected], and she can add it to your registration. These Wood Pellets Will Warm You Up! Stan Elliot, the chair of PFI's board of directors, visited Fairbanks, Alaska this week. Despite the -20 degree weather (or maybe because of it! ), he still found some wood pellets. Are there any topics that you'd like to see addressed at Breakfast & Biomass or at PFI's Annual Conference? We'd like to hear from you. Nominate speakers and suggest panels, experts, themes, and ideas. The Conference Committee wants to be sure to reflect the preferences and needs of PFI membership as much as possible. Be sure to check our updated online calendar with information on many events happening during 2018, and mark your calendars! If our calendar is missing any events that you're planning to attend, please email Carrie Annand. Follow PFI on Facebook, and Connect with Us on LinkedIn! Less than 90 days after Rentech announced it would voluntarily withdraw the company's common shares from listing on the Nasdaq Capital Market, the company has filed for bankruptcy, and sold off the bulk of its assets, including one of its Ontario wood pellet plants, and U.S. wood pellet business New England Wood Pellet. Rentech's Wawa, Ontario, pellet plant has been plagued with operational issues over the past couple of years, resulting in contract shortcomings to pellet customer Drax, which has converted three of six units at its North Yorkshire, England power station to wood pellets. The Wawa facility has been idle since early this year, and in October, Rentech announced it had entered into a deed of contract termination between Drax and the Wawa plant. Despite Rentech's Atikokan, Ontario, plant conveyor system issues, the plant has been meeting expectations, operating near capacity when needed, and meeting contractual obligations with Ontario Power Generation, according to Rentech. However, since February, it has only been operating at levels to fulfill its contract with OPG. 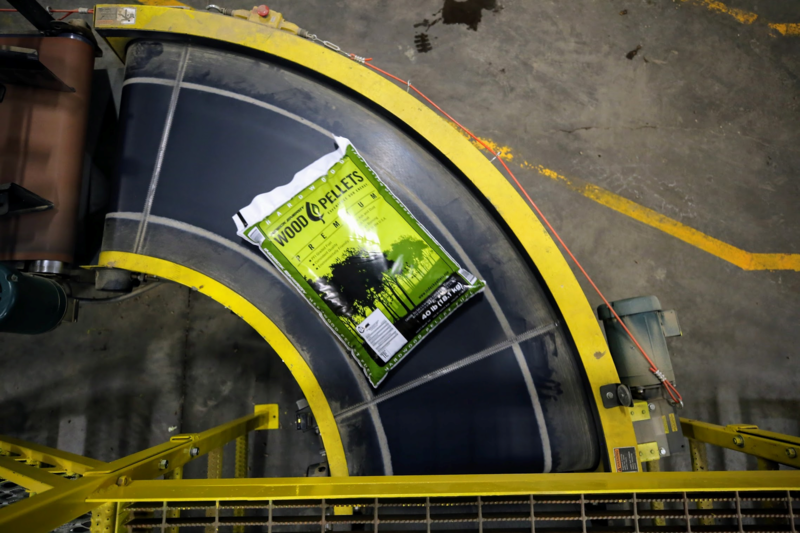 Despite its financial turmoil, in Rentech's most recent quarterly financial results report, the company stated it expects its New England Wood Pellet and Fulghum Fibers businesses to continue to generate positive cash flow, and be self-sufficient from a liquidity perspective. Rentech acquired NEWP in May 2014, which added to its portfolio three pellet facilities in Jaffrey, New Hampshire, and Schuyler and Deposit, New York. The Professional Logging Contractors of Maine and the Maine Pellet Fuels Association read the lead editorial in the Jan. 14 Central Maine Sunday, "Our View: LePage rightly opposes biomass subsidy bond," with dismay. We'd like to set the record straight on the important legislative proposal, which was inaccurately criticized by both the newspaper and our governor. The false narrative that appears to be building in response to the bill, An Act To Authorize a General Fund Bond Issue To Support Wood Energy Use in Maine, is that a taxpayer-funded bailout of the biomass industry in 2016 has failed and now the industry is back looking for more money to support itself because it cannot compete. In fact, the biomass contract incentives provided by Maine lawmakers in 2016 were always intended to act as a short-term bridge to keep the industry viable while alternatives could be developed. Everyone-including Maine Gov. Paul LePage-agrees that more efficient wood energy usage is needed to make the industry competitive. The enhanced usage of Maine's incredible forest resource is exactly what the bill now under consideration would largely fund, not through subsidies, as headlines would have you believe, but loans to be repaid in perpetuity. The editorial's subheadline, "Maine should be looking to the future for forest products, not clinging to the past," misses the point entirely and is not an example of good journalism. In reality, the future is exactly what the bond bill is trying to shape. To accelerate innovation and adoption of new practices and technologies to determine the root cause of biomass handling failures and designing solutions, the Feedstock-Conversion Interface Consortium is overseeing a directed funding opportunity (DFO) call. Interested industrial and academic partners wanting to collaborate with research experts and leverage unique technology capabilities at the U.S. Department of Energy's national laboratories are encouraged to apply. Lignocellulosic biorefineries' development and operation have suffered from failing to account for the complexity and variability of feedstock properties and composition, lack of fundamental understanding of the physics and chemistry of biomass derived feedstock preprocessing and subsequent deconstruction, poor equipment design, and flawed integration. Understanding the potential range of desired biomass specifications will enable effective handling strategies and will lead to predictable conversion performance in lignocellulosic industrial biorefineries. A successful bioeconomy is imperative for reducing dependence on foreign sources of energy, increasing global market competitiveness, enabling agricultural development, securing environmental sustainability, and producing domestic jobs toward an affordable and resilient bioeconomy.